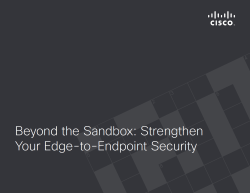 Download this white paper to explore where sandboxing technology stands today and how your organization can stay protected from cybercriminals. Organizations’ malware analysis needs have gone beyond the traditional sandboxing technologies. It’s time for a more robust malware analysis tool that can continuously detect even the most advanced threats.